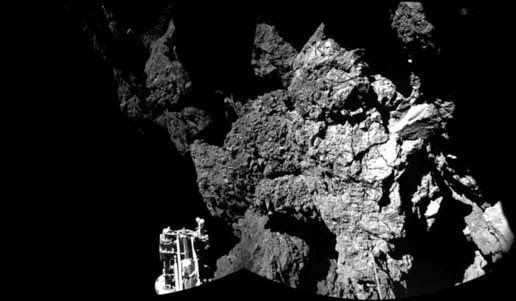 Astronomy Science ~ Fifty-six hours after landing on the surface of a comet, Philae send the data again about his new home within 310 million miles of space. Then, his strength began to run out. Currently, Philae spacecraft on the surface of comet 67P asleep after running out of battery. In this mode, all the instruments and systems mostly closed. Philae then writes twitter to Rosetta: "Rosetta, I felt a little tired, if you get all my data? I'll probably sleep for a while ..."
Rosetta mission then responded: "You have done a great job of Philae, something that has never been done before another spacecraft." And then: "Ok Philae, I've got it and you could be resting first ..."
All existing experiments on the lander has a chance to execute and return the information back to Earth. Contact was lost at 00:36 UTC, this incident was not long before the scheduled time of losing contact Rosetta orbits below the horizon. From now on, there is no contact, except for enough sunlight falls on the solar panels and generate power to awaken Philae. Currently, the mission team tried to rotate the solar panels to receive sunlight Philae more.